Max, The interview from Rap Sheet was incredible! I enjoyed it immensely! I hope to see it published at some point in the future i.e. The History of Mystery and From the Files of … Still anxious about the upcoming releases and it’s great to hear you may continue the Caleb York series. I thought the last installment, The Bloody Spur, was the best of the three. Thanks again Max, you continue to add joy and excitement to life!! My best to your lovely wife Barb!! Thanks for the great post, Paul. There will be at least two more Caleb York novels. I’m working on a Thomas & Mercer right now, which is a standalone but could launch a new series. Mickey Spillaine’s 100th birthday with lots of info on Mickey’s life and career. 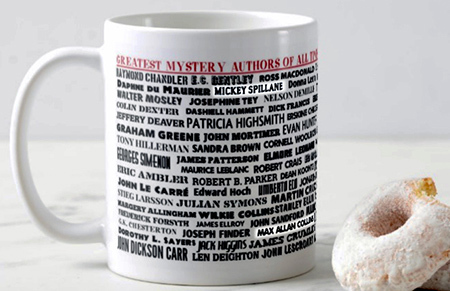 Wow, a lot of great articles and a really nice mug! Across time, and across the dimensions, a toast to Mr. Spillane. And to his friend, Mr. Collins. So, MAC, how’s your health? Reason I’m asking: your plans for the Spillane Celebration don’t seem to include any television appearances. If it’s your health that’s getting in the way of that, I get it; first things first, after all. Still, it would be kinda nice if some prime-time (or late-night) TV show would welcome you aboard, to show clips and read excerpts and tell stories about the Mick, and like that there. At the very least, please tell us that you’ve had some feelers about stuff like this. Lately, some things have been happening that tell me that Old Stuff is in the process of being forgotten – and I don’t care for that at all. Oh Hell/Ah Well, here’s to the Spillane 100!